It was great to be at the Guardian University Awards 2015 at RIBA last month where there was a great showing from Alliance Universities. I celebrated with colleagues from Nottingham Trent University as we gained triple recognition for innovative projects. NTU scooped first and second prize in the Teaching Excellence category – inadvertently competing against ourselves as one submission had originally been entered into the Community category! Top spot went to digital humanities project, Dawn of the Unread, which has transformed students’ approach to learning about culture and the arts. Led by local writer James Walker, students from the School of Arts and Humanities were involved in the conceptualisation, production, curation, marketing and dissemination of a professional quality, online interactive graphic novel about Nottingham’s past. The novel sees the city’s famous historical literary figures rise from the grave to wreak revenge against the closures of libraries and low literacy in 21st Century Britain. In its first year 112 students have engaged with the project, including undergraduates studying History, Media, Literature, Journalism and Philosophy, as well as peers in the School of Science and Technology and School of Art & Design. NTU’s SCALE-UP project came a close second in the same category – recognising the impact this is also having on significant numbers of students. The SCALE-UP approach, with its focus on learning by doing rather than listening, is proving widely applicable across disciplines. More than 30 modules in areas as diverse as Media, Sports Science, Marketing and Law now incorporate SCALE-UP, which has been shown to have many benefits for student learning, including enhanced problem-solving ability, increased conceptual understanding, and higher attendance and satisfaction rates. 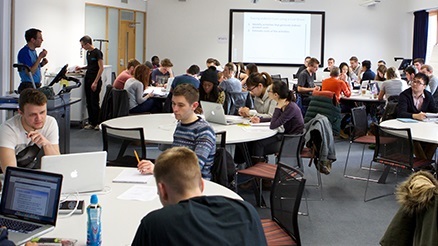 Originally developed in the USA as an alternative to lecture-heavy teaching, NTU is the first UK university to offer full institutional support for the method, which includes replacing lectures with group problem-solving activities in a specially designed learning environment. For those interested in deploying estate and resources the implication for traditional teaching spaces is significant. For example, at our Clifton campus academics, estates professionals and our Head of Academic Development Jane McNeil have worked together to re-think the design of a new teaching building opening in 2015/16. It will now have only one conventional lecture theatre and ten flexible spaces with plenty of round tables for IT enabled discussions. These are all fundamental to SCALE-UP. Do get in touch with us if you are interested in this approach. NTU also took home first prize for the Business Partnership Award. This was awarded to a project led by Dr. Petra Moltan-Hill in the Nottingham Business School (NBS) and community enterprise Nottingham Energy Partnership, supported by the University’s ERDF Future Factory. As part of their core curriculum, NBS students acted as consultants to local businesses to help them reduce greenhouse gas emissions and achieve Investor in the Environment (iiE) Accreditation. In Autumn 2014, 25 organisations were also supported towards gaining Environmental Management Systems (EMS) accreditation. Local businesses included the Castle Rock Brewery, Cloud Cars, Wego Couriers and traders such as Honest Inks toner recycling, alongside the four local Clinical Commissioning Groups and Broxtowe Borough Council. The project demonstrated the key role business schools and students can play in providing practical support in the shift to a low carbon economy. They help businesses across all sectors reduce their environmental impacts and develop niche low carbon products and offers. Student participation filled skills, funding and time gaps that often prevent businesses from gaining accredited EMS. The Guardian University Awards 2015 highlighted other great examples from a wide range of universities. A common theme emerged from the night – one of working with students to create interesting and challenging learning opportunities. Sometimes students can prove adept at pushing the challenge back to the lecturer – particularly if things do not work as smoothly as hoped. We talk a lot about building student resilience in designing such opportunities but in fact, to be an innovative teacher requires resilience in a class of its own. Congratulations to all those nominated at Guardian University Awards 2015 – resilience rewarded! Professor Eunice Simmons is Pro Vice-Chancellor (Academic) at Nottingham Trent University. Alliance universities were winners or runner-ups in 11 of the 14 categories at the Guardian University Awards 2015. Read more about our success here.